Perform a silent, unattended or slipstream installation of QZ Tray, such as in a corporate environment. We use NSIS (Nullsoft Scriptable Installer System) for Windows. We use Makeself for Linux. We can use the installer command on Mac to silently install QZ Tray via the command line. Type (or click here): man installer on the command line for more examples. Note: Use at your own risk; Non-standard install locations are currently not supported. QZ Tray 2.1 automatically launches for all users after computer restart or login/logoff. For versions 2.0 and older, the user must click "Automatically Launch" in the tray icon, which may not be desired for corporate environments. 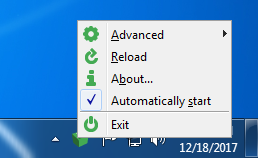 First, uncheck "Automatically start" and close QZ Tray. Run the following command through a Command Prompt window. Administrative access is not required. For white-label customers, replace QZ Tray with the name of your application, e.g. Acme Printing, etc. Re-launch QZ Tray and verify the "Automatically start" option has been reselected. To secure this change (user cannot disable) requires modifying registry permissions using regini and a separate .reg file which can have other negative side-effects and is out of scope of this tutorial.